The story of 311 Squadron is unique in many ways, not only was it the first and only Czechoslovakian bomber squadron in the RAF, it was also the first non-British bomber unit to attack Hitler’s Third Reich. In addition, it is also unique, in that although its flying personnel came from a landlocked nation, the unit was still able from 1942 onwards to make a major contribution to maritime air operations during World War Two. The squadron’s story actually begins in 1940 in southern France, when some 200 Czechoslovak airmen gathered at the port of Vendre towards the end of June. The defence of France was crumbling and they knew that they had to make every effort to get to Britain and continue the fight against the Nazis. They had been serving with the French Air Force mainly in the Agde and Bordeaux areas. Together with a number of other ‘refugees’ including a group of Belgian airmen, they boarded a freighter, the SS Apapa and began the journey to Britain, arriving at Liverpool on July the 9th. Prior to this another group of some thirty Czechoslovaks had arrived at Falmouth, they had sailed from, Bordeaux with a group of Poles in two small Dutch coasters, the Ary Scheffer and the Nettie. The ships had escaped from Bordeaux days earlier in the company of the Berenice, the Orpheus and a tugboat, the Seine. They split up and unfortunately the Berenice was later torpedoed by the U-65. Nine survivors were picked up and later landed at Falmouth. The Czech personnel that had arrived at Liverpool were initially accommodated under canvas at Beeston Castle in Cheshire. Once the numbers grew the majority of soldiers and airmen were accommodated temporarily at Cholmondely Park in Cheshire, again under canvas. The camp was visited by President Beneš on the 27th of July 1940, a parade was held and Beneš spoke to the soldiers and airmen which greatly boosted morale. President Eduard Beneš with escaped Czechoslovak military personnel, Cholmondely Park 1940. Much thought was being given to organising the growing numbers of refugee airmen that were turning up in Britain and Air Ministry document No.2514/PDO made reference to forming new squadrons from allied personnel who had been evacuated from France and detailed the fact that three bomber squadrons were to be formed; 304 and 305 Squadrons with Polish personnel and 311 Squadron with Czechoslovak personnel. On the 12th of July a further group of Czech servicemen arrived at Liverpool aboard HMS Neuralia. They were followed the next day by another group aboard the Egyptian freighters Rod el Farag and Mohamed el Kebir. 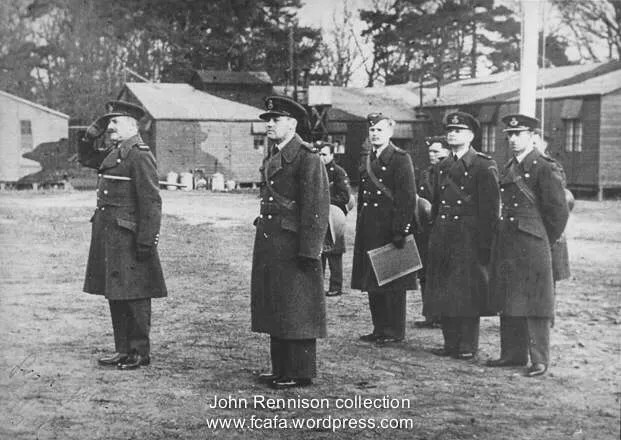 After a brief stay at the RAF station at Innsworth Lane in Gloucestershire, most of the airmen moved to RAF Cosford, which was to become the Czechoslovak Depot (it was to move to Wilmslow in December 1940 and to St Athan in February 1942). At Cosford they were billeted in Fulton Block, this huge edifice was at the time the largest barrack block in Europe. Here, the airmen were sworn in as members of the Royal Air Force Volunteer Reserve (RAFVR), the officers were formally commissioned and they began to attend classes in the English language. 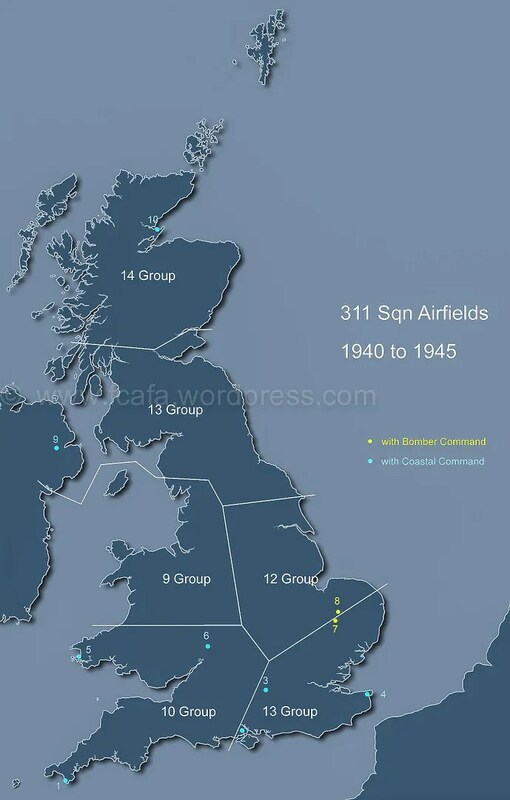 A number of personnel were detached for training as wireless operators to No.1 Signals School (previously No.1 Electrical & Wireless School) at RAF Cranwell and for bombing and gunnery training to No.4 Bombing and Gunnery School at RAF West Freugh. All but ‘formed’ the embryo squadron moved to the RAF station at Honington, near Thetford in Suffolk, where it was officially established as No. 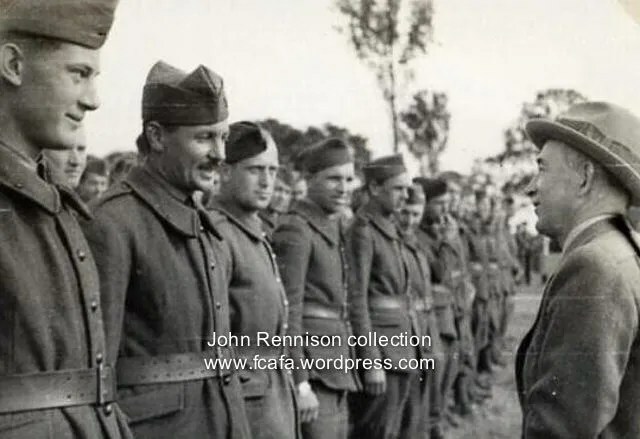 311 (Czechoslovakian) Squadron, part of No.3 Group of Bomber Command on the 29th of July ( in contradiction of this ‘paper date’ the squadron always held that its actual date of formation was 2nd of August). The unit was initially under joint command, with Wing Commander Karel Mareš (who chose to change his surname to Toman to protect family and relatives who remained in the former Czechoslovakia), together with Wing Commander John Griffiths DFC, a Canadian serving in the RAF. (Griffiths had been a pilot in the first World War and had received his DFC following one of the earliest forays by the RAF against German warships in the Schillig Roads, north of Wilhelmshaven, Germany, in December 1939). Vickers Wellington Mk Ic, R1378 as flown by Sgt Leo Anderle. For initial training the unit employed four Anson aircraft (three new aircraft R9600, R9648 and R9649, plus K6296 an older aircraft delivered to the RAF pre-war), with the addition of ten early model Vickers Wellington IA and 1C twin-engined bombers. This was a comparatively modern airplane, having entered RAF service in the late 1930’s, it Bristol Pegasus radial engines giving it a maximum speed in the region of 230 miles per hour and its power operated gun turrets providing it with a good defensive capability in comparison with its contemporaries. The training of Czech personnel continued with No.2 Signals School at Yatesbury and the School of Technical Training at Henlow being used, not least by army personnel volunteering for service in the newly established Czechoslovak squadrons. By early August the unit had a strength of some 269 airmen. Griffiths remained in joint command until November, he was to survive the war only to be killed in an unfortunate road accident in Belgium just after the cessation of hostilities in May 1945. By the early part of August the unit comprised 56 officers, 51 NCO’s and 162 airmen. The first training flights taking place on the 13th of August using Anson aircraft. Honington was an excellent base for 311 Squadron if only for the fact that 9 Squadron (a Wellington equipped bomber unit) which was also based there, was one of Bomber Command’s top squadrons and the Czechs were able to learn of the workings of an operational RAF squadron at first hand. The period of ‘work up’ with the Wellingtons occupied some weeks and included a good deal of night flying, for which purpose the unit utilised the satellite airfield at East Wretham. To begin with six operational aircrews were brought together to form ‘A’ Flight, to commence operations using the squadron’s Wellington aircraft. A number of RAF personnel were involved in bringing the unit up to operational standard. They included Sqn/Ldrs Geoffrey Amison, Henry Graham and ‘Percy’ Pickard DFC, Flt/Lt Norman Samuels DFC, Flt/Lt A Macnicol, P/O W. Morrison, P/O Albert Roman, F/Sgt Alexander Gordon, F/Sgt Patrick Hennigan DFM, Sgt George Powis and numerous other aircrew and ground staff. Pickard was already well known in RAF circles, not only for his operational feats, but also for his habit of wearing ‘cowboy style’ boots with his uniform and the fact that he was accompanied everywhere by his sheep dog ‘Ming’. He had been on 214 Squadron before the war and it was likely that he would have contacted some of his former colleagues with a view to their joining him. Later in the year others such as Flt/Lt Thomas Kirby-Green, F/O James Robinson, F/Sgt ‘Jack’ Rennison (also with 214 Squadron before the war) and Sgt Ernest Robb arrived. Kirby-Green had already completed 27 Operational sorties and was to be with the squadron for just less than a year, before moving on to 40 Squadron. He was shot down on 16/17 October 1941 during a raid (his 37th operation) on Duisburg and became a Prisoner of War. He was later to die at the hands of the Gestapo in April 1944, following the ‘Great Escape’ from Stalag Luft III at Zagan. A second 311 Squadron member, navigator Flt/Lt Arnošt Valenta was also involved in the ‘Escape’ and died in similar circumstances. By the end of August nearly 900 Czechoslovaks had arrived in Britain and the figure was to rise to well over one thousand by the end of the year. The squadron’s first operational sorties were carried out on the night of the 10th of September, when three crews took off from Honington to attack the railway marshalling yards near Brussels. The three aircraft were captained by Sqn/Ldr Josef Schejbal in Wellington L7778 KX-U, Sgt Václav Korda in Wellington P9235 KX-C and Sgt František Taiber in Wellington L7785 KX-R. Two of the aircraft (L7788 and P9235 both bombed the marshalling yards at Brussels, observing hits in the target area. The third aircraft L7785 KX-R was unable to attack the primary target because of cloud and bombed a canal to the north of Brussels instead. This latter aircraft had as its second pilot Flt/Lt Josef Ocelka who would later become the squadron’s commanding officer. One of the gunners in Korda’s aircraft (P9235) was Sgt Vilém (Vilda) Jakš, who in the nineteen thirties had been the Czech middle-weight national boxing champion. In 1935 he had fought Frenchman Marcel Thil for the world championship, but unfortunately was not successful. Shortly after this on the 16th of September at fourteen hundred hours, the six crews of ‘A’ Flight said farewell to Honington and set off for the nearby grass airfield at East Wretham. 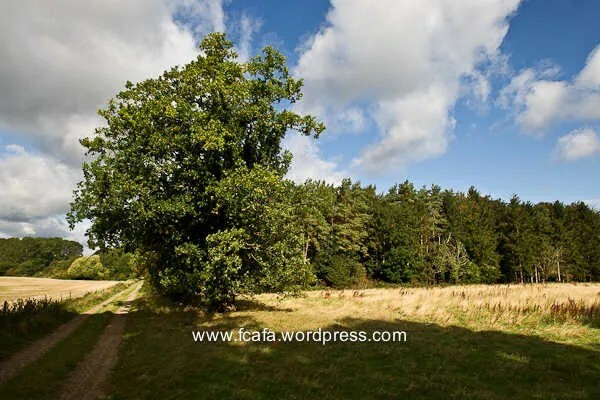 Situated on heath-land to the north east of Thetford, the grass landing ground was already familiar to the Czechoslovak airmen, as they had used it in previous weeks as a satellite for training (night flying) purposes. Ground crew and other personnel were transported by lorry and just as the vehicles were being unloaded, a lone Dornier bomber appeared and circled the airfield. The alarm was raised and the enemy aircraft was greeted with a hail of machine gun fire. This had the required effect and the Luftwaffe’s representative decided to seek easier pickings. Unfortunately he was out of luck, as his next choice of target was Honington, where he was later damaged and brought down by anti-aircraft fire. Conditions at East Wretham were somewhat primitive, with many personnel having to be housed under canvas. The airfield suffered from poor drainage often becoming waterlogged in winter. Various attempts were to be made to improve things, but without much success. The situation was eventually remedied in 1943 (long after 311 Squadron had left) by the use of a PSP (Perforated Steel Planking) surface. The accommodation problem was somewhat alleviated when a number of personnel moved to the nearby ‘Manor Farm’, just to the north of the airfield. The overnight rise in the population must have been a traumatic event for the villagers of East Wretham, but they soon took the Czechoslovaks to their hearts. Nearby Wretham Hall (which had been rebuilt following a fire in 1914), just a mile west of the village church, was taken over to provide additional accommodation . This old country house set in acres of park land, had previously been the home of Sir John Dewrance CBE. From 1939 it had been used by Barnardo’s as a Children’s Home. 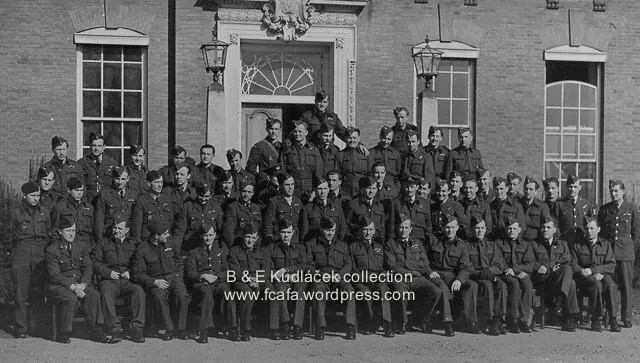 In October 1940 they handed it over to the RAF and the children were moved to Wangford Hall in Suffolk. Excitement was high on the evening of the 23rd of September when the squadron discovered that it was detailed to take its bombs to the heart of the Third Reich, they were to attack Berlin. Three aircraft were listed for the raid, captained by Wg/Cdr Karel Toman, P/O Karel Trojáček and P/O Bohumil Landa. On the return flight, whilst over Holland P/O Trojáček’s Wellington (L7788 KX-E) began to have engine problems. Knowing that he would be unable to make it back to England, Trojáček decided to make a forced landing in a snow covered field not far from the Hague (near the village of Leidschendam). Sgt Karel Kunka who shot himself with a flare gun rather than be taken prisoner. Realising that they would be coming down in enemy occupied Holland, the crew set about destroying the radio and navigational equipment, which might be of benefit to the enemy. Trojáček managed to get the aircraft down in good shape and none of the crew were injured. The crew all survived the crash landing and having exited the stricken aircraft they tried without success, to set it on fire to prevent it from falling into enemy hands. They split into two groups and set off in the darkness heading for the coast, with visibility limited to a few yards, they plodded on with the mist swirling around them, leaving a tell-tale trail of footprints in the snow. Just before midday on the 25th Trojáček’s group was discovered by the German military using tracker dogs. Sgt Karel Kunka, the aircraft’s wireless operator, was unable to accept the idea of capture and tragically put the Verey pistol to his head and shot himself in a granary in Wassenaar. He was taken to hospital in the Hague where he died the following day (He was buried in The Hague [Westduin] General Cemetery). The Germans were able to repair the Wellington at nearby Schipol and after having re-marked it with Luftwaffe crosses (although the aircraft strangely still retained it squadron codes of KX-E ! ), they carried out a series of test flights using the aircraft. 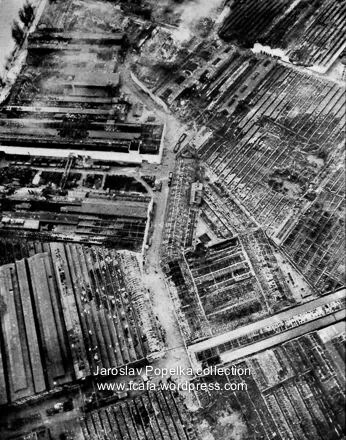 The captured airmen were initially taken to be Polish and were sent to a PoW camp near Frankfurt. However, it was here that their true nationality was discovered, their RAF numbers (in the 78 series) letting the cat out of the bag. 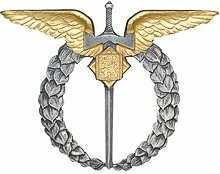 Czechoslovakia had been split following the Nazi invasion into the so called ‘protectorates’ of Bohemia and Moravia and the a separate Nazi governed state set up in Slovakia and this created a problem for any of the squadron’s personnel that fell into the hands of the Nazis. The Czechs in particular were considered by the Germans to have committed an act of treason by flying with the enemies of the ‘Third Reich’ and for that reason the Germans didn’t want to treat shot down airmen as PoWs. Some of those who initially found themselves in captivity ended up in ‘Concentration Camps’. Trojáček and his colleagues were taken in early 1941 under armed guard to Gestapo Headquarters in Berlin. They were kept in solitary confinement for many months and subjected to all manner of indignity and degradation. In April 1942 they discovered that they were to be sent to Prague and tried with treason. Early in May they arrived at the infamous ‘Petschkův palác, the notorious Gestapo HQ, where they were interrogated by a member of the Gestapo and a Czech ‘collaborator’ (this may have been Augustin Přeučil, who was a Nazi spy who had masqueraded as an escaping airman in 1940 and had been accepted into the RAFVR. In September 1941 whilst serving with 55 OTU at RAF Usworth, he faked his death supposedly having crashed into the sea in his Hurricane (W9147) during a practice dog-fight. However, he flew the aircraft to Belgium and handed it over to his Nazi masters. He went on to assist the Gestapo in interrogations and played the part of a captured flyer in order to get intelligence from captured airmen. His British wife of three months, Muriel, believed that he had died and didn’t discover that he had been a Nazi spy and had survived until many years later. Within three weeks all their relatives had been arrested. They were told that they had been found guilty of treason under German Military Law and that they had been sentenced to death by hanging. The sentence was to be carried out at the notorious Pankrác prison in Prague, in the presence of their relatives. Many months were to pass before the intervention of the International Red Cross with the backing of Churchill himself, pushed the Germans into treating Czech airmen as PoWs. The sentence imposed upon Trojáček and his crew was postponed on a number of occasions. Fortunately because of the pressures the Germans relented before the sentence was carried out and the prisoners were moved to a PoW camp (Stalag Luft III) in February 1943. Přeučil l was sentenced to death for his wartime treachery and was perhaps ironically in Pankrác prison in April 1947. On the afternoon of October the 1st 1940 the unit suffered its first casualties as a result of a non-operational accident. An Anson (R9649) trainer aircraft of the squadron crashed at Elton near Peterborough following an on-board fire, caused by the negligent discharge of a Verey-Light Pistol, which some sources state was the fault of the wireless instructor, RAF Sgt George Powis. He did not survive and three of the squadron trainees, Sgt František Koukol, P/O Jaroslav Skutil, P/O Josef Slovák and the second pilot, Sgt Oskar Valošek, also died in the subsequent crash. P/O Ludvik Němec, the pilot and P/O Jaroslav Kula managed to parachute to safety. Just over two weeks later, on the morning of October the 17th, Wellington L7786 came to grief whilst on a training flight, when it struck power cables near Needham Market. Sgt Karel Lang and Sgt Oldřich Tosovšký both died in the crash. The aircraft came down at Pipps Farm, Coddenham. On the night of October the 16/17th the squadron had despatched several aircraft to bomb Bremen and Kiel. One of these, Wellington KX-T L7844, became the first aircraft from the squadron to fall victim to an enemy night fighter. The aircraft was shot down by Lt. Ludwig Becker of 4/NJG1 over western Holland. Becker attacked the bomber from behind setting the starboard engine on fire. The stricken Wellington began to lose height before spinning into the ground and bursting into flames. Only two of the crew; Sgt Emanuel Novotny and Sgt Augustin Šesták managed to bale out in time and were later captured by the Germans, the rest of the crew (the pilot P/O Bohumil Landa, the navigator P/O Hubert Jarošek, Sgt Ottoák and Sgt Karel Klimt) all perished. They are now interred at the CWGC cemetery at Oosterwolde General Cemetery, Holland. A second aircraft (Wellington KX-K N2773) under the captaincy of Flt/Lt Josef Šnajdr, was returning to base from the raid, when it became iced up. The radio failed and due to the ground being totally obscured by, cloud the crew were unable to get a positional fix. Hoping for a break in the cloud, Šnajdr decided to stay airborne to the limit of his fuel. He took the aircraft down to below five hundred feet and the crew had a brief glimpse of a strange piece of coastline, but were still uncertain as to where they were. Sometime later with the fuel rapidly running out and no break in the overcast, Šnajdr reluctantly ordered the crew to prepare to jump. After a quick round of handshakes and good luck wishes, the crew one by one leapt out into the blackness. It was raining heavily, thus the crew got a soaking to add to their misfortune. One crew member, after a safe landing, knocked at a cottage door and requested help. He was promptly held up at gun point by the irate cottager. For him this was the last straw and he fainted! He came-to some time later comfortably ensconced in an arm chair and had his spirits revived with a mixture of tea and whisky. He was then collected by the village policeman and spent the remainder of the night at his home. A second crew member arrived at the village doctor’s home, having spent an hour trying to get down from a tree in which his parachute had become entangled. Unfortunately things did not go well for P/O Miloslav Vejražka, the wireless operator, officially it was reported that his parachute had failed to open properly and that he fell to his death (although other accounts suggest that he was shot and killed by members of the local Home Guard, who mistook him for a German paratrooper!). The aircraft came down near Blidworth in Nottinghamshire. A third Wellington N2771 KX-H, having been hit by flak over Kiel, also became iced up on the return to base. The aircraft suffered radio and compass failures and the crew were unable to obtain an accurate positional fix. Way off course in the darkness they collided with a barrage balloon cable. This mangled one of the bomber’s wings and it crashed close to the RAF Fighter Command’s headquarters at Bentley Priory. The only crew member to escape from the stricken aircraft was the tail gunner P/O František Truhlář, who was none the less badly burnt (He later returned to operational flying, having retrained as a fighter pilot and served with 312 (Czechoslovak) Squadron). The others who died in the crash were the pilot, Sqn/Ldr Jan Veselý; the second pilot Sgt František Zapletal; the navigator P/O Jaroslav Slabý; the wireless Operator, P/O Jaroslav Matoušek and gunner Sgt Josef Albrecht. Because of the losses suffered by the squadron it was temporarily withdrawn from operations during the last week of October and commenced some seven weeks of intensive training. Wg/Cdr Griffiths, the RAF Squadron Commander, was posted away at this time and replaced by Wg/Cdr William Simonds. On the 15th of November, the squadron was called upon to perform a task, which in the light of future events could be considered somewhat prophetic. A Wellington of 115 Squadron from Marham, had ditched in the North Sea and 311 Squadron was asked to assist in the search for the crew, who it was thought had taken to their dinghy. Three Wellingtons were supplied for the search and took off shortly after sunrise. The downed crew were eventually found by the Wellington captained by Sgt Jan Hrncir. The crew of the ditched aircraft were later picked up and brought ashore. The loss of Karel Trojáček and his crew was at this stage having a marked effect on squadron morale. All the crews knew that if captured they were likely to be subjected to torture and that any family still in Czechoslovakia would suffer. It was quite seriously suggested by some members of the squadron that it would be better if they flew without parachutes! Certain death being preferable to torture and imprisonment by the Gestapo should they have to abandon their aircraft. Another suggestion was that the unit should be sent to the middle-east theatre. On the night of the 8th/9th of December Sqn/Ldr Pickard and his crew in Wellington R1021 KX-W accompanied by Wellington L7842 KX-T carried out a raid on Boulogne. This was intended as a morale booster, but more difficulties were to come. Refusals to fly led in one case (787564 Sgt Karel Novotný) to a court martial and in at least one other (787620 Sgt Karel Fák) to transfer to the army. The squadron was eventually declared fully operational once more in December 1940, attacking half a dozen targets by the end of the month. The return to operational status was marred by the loss of Wellington KX-G T2577 on the 16th when it crashed just after taking off for a raid on Mannheim (This raid was code named ‘Operation Abigail’ and was intended to be in retaliation for the bombing by the Luftwaffe of Coventry and Southampton). Eye witnesses described how the aircraft, under the command of Sgt Jan Křivda, circled the airfield at a height of about a hundred feet. Suddenly, the Wellington appeared to collide with some tree tops, it heeled over and crashed on the road between East Wretham village and Wretham Hall, bursting into flames. The tree clipped by Q-Queen. Wellington was flying from right to left. The navigator, P/O Vladimír Nedvěd was shocked but uninjured, he realised that Sgt Křivda was dead and set about extricating himself from the burning wreck. He discovered that Sgt Josef Pavelka although badly injured was still alive and dragged him from the stricken aircraft. As he staggered away from the wreck he heard a scream and despite his exhaustion began to turn back towards the inferno. At that moment he stumbled and under the weight of Pavelka’s body, fell to the ground. It was a fortunate trip, as both men lay on the ground the bomb load of ‘Q’ Queen began to explode, the stumble had probably saved both their lives. Nedvěd got back to his feet and began to make his way back to the aircraft to free P/O Jaromí Toul , who was trapped in his gun turret. With its bomb load exploding, the aircraft was a sea of flame. The violence of the explosions threw Nedvěd to the ground several times, but he still tried to smash his way into the turret to extricate his badly injured comrade. Toul was eventually freed when help arrived from the airfield but was later to die of his injuries. Nedvěd was himself burnt as a result of his courageous actions and was to be awarded the MBE in recognition of his gallantry. He survived the war and finally settled in Australia. On the 22nd of the month the squadron operated against Ostend Docks and Flushing. The crews hardly had time to recover from their post Christmas headaches, before they were again in action on the 27th of December against the ‘U’ Boat pens at Lorient. The New Year having been duly consecrated, the squadron began to prepare for a raid on Bremen on the night of the 1st/2nd January 1941. It was Christmas-card weather, there had been a light fall of snow during the evening. As preparations were underway a new crew arrived in their aircraft from Honington. 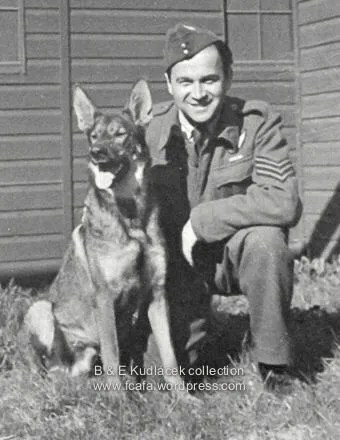 With them was an Alsatian dog named ‘Antis’, who was to become on of the squadron characters. From the purists point of view he could not be thought of as ‘human’, but he was most definitely ‘one of the boys’. As a detector of aircraft, whether friend or foe, he ranked supreme through using a combination of hearing and sixth sense. He was to become a familiar sight at the dispersal point, head on paws, awaiting the return of his master Sgt Václav Bozděch. Even when nothing was audible to the human ear, Antis would raise his head and prick up his ears and the ground crews would know that the aircraft would soon be back at base. Antis actually flew on operations and was even wounded over Germany by a flak splinter. After the war he was awarded the ‘Dickin Medal’, the Victoria Cross of the animal world. On 2 January the squadron raided Bremen where they met with a warm reception. On his return P/O Antonín Kubizňák counted eleven flak holes in his Wellington (R1022 KX-K). His front gunner, Sgt Rudolf Bolfík, had a lucky escape when a flak splinter tore through the leather of his flying boot (Bolfík had served in the infantry in the Spanish Civil War). Luck is at best a fickle thing ! 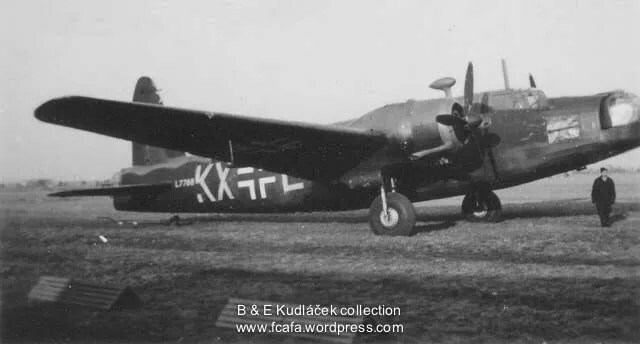 some two weeks later Bolfík together with the rest of Kubizňák’s crew (Second pilot Sgt Bohuslav Baumruk; navigator F/O Josef Hudec; air-gunner P/O Jaromir Král and wireless operator P/O Jindřich Leskauer) went missing in Wellington T2519 KX-Y during a raid on Wilhelmshaven. The aircraft was thought to have experienced engine trouble and to have ditched in the North Sea (the last message was an SOS at 2218 hours, placing the aircraft over the North Sea and flying on one engine), there were no survivors and they are commemorated on the RAF Memorial at Runnymede. It wasn’t only aircrew that were risking their lives, a young Czech airmen (AC.2 Jindřich Liebold who was only 19 years old) was killed by bomb splinters when Honington was raided by a lone Dornier on the 5th of January. On the 18th of January the weather closed in, a blanket of fog settling over the airfield. It was however a ‘Red Letter Day’ for East Wretham as the Squadron was visited by no lesser personages than King George VI and Queen Elizabeth. The weather remained poor until the 28th and operations were suspended. On the 3rd of February a lone enemy bomber carried out a sneak raid on the airfield dropping some twenty bombs. Most of the hardware fell on the north side of the field. Only one aircraft was slightly damaged and no casualties were recorded. Three days later a series of events began to unfold when P/O František Cigoš, the captain of Wellington L7842 KX-T had to replace his normal navigator P/O Jaroslav Partyk, who had been taken sick shortly before the aircraft was due to take off for a raid on Boulogne. The last minute replacement was Flt/Lt Emil Bušina, it was to be his first operation with the squadron. The outward flight provided little trouble, the aircraft cruising well at an altitude of 18,000 feet. Cigoš made the run into the target and within a few minutes the wireless operator, P/O Arnošt Valenta was able to contact base with the news that the bombs had been dropped on target. Cigoš set course for home and handed over control of the aircraft to the second pilot, Sgt Petr Uruba. After half an hour or so, a correct course and bearing were requested from East Wretham by the radio operator. Bušina was apparently not feeling well and at this point there was some argument with regard to the aircraft’s position and heading. Unfortunately, the radio failed at this crucial moment and although Valenta attempted to get it working again he was unable to do so. Cigoš continued on what he considered was a correct course of 270 degrees and began to descend through the cloud. On breaking through the overcast he saw only a vast expanse of water. Some thirty minutes later a flashing beacon was dimly seen through the encroaching mist. With the weather deteriorating and the fuel getting lower and lower the situation was becoming desperate. The general opinion was that the aircraft was somewhere over Britain, possibly Norfolk or over the Wash. Just before midnight a small airfield was sighted. Cigoš circled once and switched on the navigation lights. A signal was flashed to the ground requesting that the runway lights be switched on. Two rows of yellow lights flickered on and the runway was bathed in light. The strip was short but Cigoš made a good landing and brought the aircraft to a stop just off the end of the runway. The fuselage door was opened and the crew gathered in the entrance. A group of about twenty men was approaching from a nearby hangar. Gustav Kopal, the front gunner stared with disbelief; some of the group were wearing ‘coal scuttle’ helmets ! … they were Germans ! The crew scrambled hastily back to their positions. With a sudden jerk the aircraft began to pull away but in the darkness and confusion it left the runway and sank up to is axles in the soft turf. Arnošt Valenta grabbed his coded list of frequencies, which was printed on rice paper and was still chewing madly as the German soldiers surrounded the aircraft. Fate had played a cruel trick on them they had landed at Flers near Caen in occupied France. The future held only imprisonment and humiliation at the hands of the Nazis. It was only in post war years that an enquiry was held and the full details of their capture became known. Arnošt Valenta became one of the airmen who took part in the ‘Great Escape’ from Zagan. He was recaptured and shot by his captors in an act of revenge. The aircraft was salvaged by the Germans, re-marked with Luftwaffe crosses and swastikas, although strangely it retained its 311 Squadron codes. It was later flown to the Luftwaffe experimental base at Rechlin for testing and evaluation and was given somewhat garish yellow undersides. Throughout the spring months the squadron operated at full strength carrying out a succession of raids (comprising a total of nearly two hundred sorties), taking in such targets as Bremen, Cologne, Calais and Lorient together with three trips to Berlin. The night of the 8th of April brought a narrow escape for Wellington P9230 KX-X, when it was attacked by a marauding Ju.88, whilst on a night training flight. The c aptain of the aircraft, P/O Jan Hrnčíř was wounded in the head and the trainee pilot Sgt Jaroslav Nýč took over and made a forced landing with the damaged aircraft near Mundford. It is possible that the enemy pilot was Hptm Karl Hulshoff of NJG2, who claimed a Wellington as shot down some 30 miles east of Bridlington. Wellington R1599 KX-J took off at 2055 hours on the night of the 17th to carry out a raid on Berlin. Nothing was heard other than an SOS, sent shortly after the aircraft had come under attack by an enemy fighter. The aircraft had dropped its bombs on target and was returning to base when it was attacked. It was shot down by Hptm Werner Streib of St1/NJG1, five miles east of Weert in Holland at 2339 hours. The crew of Sgt František Kráčmer comprised second pilot F/O František Sixta, navigator F/O Vladimír Kubíček, wireless operator P/O Václav Košulič and gunners Sgt Rudolf Lifčic and Sgt Václav Štětka; all were listed as missing and are now interred at Jonkerbos War Cemetery, Nijmegen, Holland. On the 11th of May the squadron’s target was Hamburg. When his aircraft was hit by flak over the target , Sgt Benedikt Blatný the pilot was wounded in the head. Despite his injury he insisted on piloting the aircraft away from the danger and once he felt that they were safely on their way back to base he handed over control to the second pilot, Sgt Adolf Musálek, who was on his first operational flight! Blatný was later awarded the DFM for his bravery. 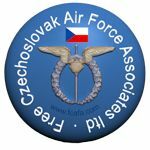 On Friday the 20th of June the squadron was visited by their President Dr. Beneš, Jan Masaryk (the Czechoslovak Defence Minister) and AVM Karel Janoušek, the Commander of the Czechoslovak Air Force Units plus various other senior military personnel. It was to be a month of VIP visits; on the 24th the whole squadron paraded before AVM Baldwin, who presented Sqn/Ldr Josef Ocelka with the DFC in recognition of his leadership and courage, and also presented the MBE to P/O Nedvěd in recognition of the bravery he displayed the previous December. The very next day the squadron was visited by HRH The Duke of Kent in the company of AVM Baldwin, whilst the squadron was preparing for a raid on Bremen that night. On the night of the 1st/2nd of July the squadron sent eight aircraft against Brest. The ‘Prinz Eugen’ was in port. She had arrived after leaving the ill fated ‘Bismark’, which had been sunk on the 27th of May. The aircraft began to get airborne at 2145 hours and the attack was made in the company of Wellingtons of No.9 Squadron from Honington. In spite of heavy ground fire the attack was pressed home and at least one direct hit was scored. A bomb crashed through the deck of the ‘Prinz’ and destroyed the radio room. Fifty one members of the crew were killed and the damage was serious enough to prevent the ship from sailing the next day. There was some controversy as to whether 9 Squadron or 311 Squadron had scored the hit. However, it is of note that upon his return, P/O Václav Korda reported that the first bomb of his stick had fallen on the base area of Number Eight Dock. If this was in fact the case then it is probable that the last bomb of the stick would have struck the stern of the warship. All the aircraft had returned by twenty minutes to five in the morning with one exception; Wellington R1516 KX-U was shot down in error by a Beaufighter (T4638) of 604 Squadron at Lower Park Farm near Mere in Wiltshire. The Wellington had suffered the failure of both its radio and IFF installation and the night-fighter pilot took it to be an enemy intruder. Wellington R1516 was a presentation aircraft, known as ‘Broughton Wellington’ (the second aircraft to be so named) and had been paid for by the workers of the Vickers factory at Chester. The crew (pilot Sgt Oldřich Helma; second pilot Sgt Antonín Plocek, navigator P/O Richard Hapala, wireless operator Sgt Adolf Dolejš and air-gunners Sgt Jaroslav Petrucha and Sgt Jaroslav Lančík) all perished. Two days later five aircraft were despatched against the Krupp armaments factory at Essen. All had safely returned by a few minutes after five in the morning. A further two aircraft operated against the Gilze-Rijen airfield, in Holland and they too had returned safely to base by four thirty. At quarter past eleven in the evening of the 5th of July 1941, the first of ten aircraft clambered into the air and set course for the German city of Munster. It was to be a night during which gunners would play their part to the utmost and enemy fighters would be much in evidence. F/Sgt Karel Schoř, in Wellington R1451 KX-P turned on course for home with ‘Bombs Gone’. Suddenly out of the blackness an enemy fighter appeared. The Wellington resounded to the clatter of gunfire as the gunners let fly. The Me.110 night-fighter broke off its attack only to reappear within minutes for a second try. Sgt Ladislav Kadlec, the rear gunner, rapidly swung his turret and opened fire. The stream of tracer from the fighter suddenly converted into pain and noise and Kadlec realised that he had been hit in the leg. Things were becoming increasingly difficult for F/Sgt Schoř as he fought to keep the aircraft on course for home. The aircraft had been damaged by flak; the starboard wing had a large hole in it and the flap was all but shot away. The final act of the drama came just when things appeared to be coming to a satisfactory conclusion. Schoř was worried about the starboard undercarriage, which had probably been damaged. On the landing approach with wheels down everything looked to be in order. At the moment of touch down the aircraft suddenly slewed across the runway, the tyre of the starboard wheel was flatter than an English pancake. Using every ounce of his strength, Schoř brought KX-P to a grinding halt. They had managed to get back in one piece. As a result of the night’s action Kadlec had to have his leg amputated. Nine months later however, he was back in action with the squadron, the first and only one legged Czech airman in RAF service. That same night the ‘Reaper’ was to stretch out his hand again, but the courage of the young Czech airmen would once again frustrate his attempts to add them to his tally. Wellington R1532 KX-R was bound for home, cruising quite happily, when the blackness of the night was split by the bright splotch of tracer bullets. The shells smashed into the aircraft and immediately a fire started in the lower inboard and centre section of the port wing. Sgt Stanislav Linka was at the controls and speedily took evasive action. The wing fabric was blazing merrily and the fuselage and the cabin curtain behind Linka were also afire. Feverishly the first pilot F/Sgt Josef Bernát, the navigator P/O Jaroslav Kula and the wireless operator F/Sgt Rudolf Haering, set to work on this latest threat. Linka and Bernát changed places and finally the fire was extinguished. Unfortunately, more ill fortune was in store, the hydraulic system was not functioning and the rear turret had been hit and disabled. The enemy night-fighter was coming in for another attack. The rear gunner, Sgt Jindřich Beneš managed to manipulate the turret by hand and get the enemy fighter in his sights. He saw a splatter of sparks as his shells struck home and watched with satisfaction as the enemy aircraft dived away. With the hydraulic system out of action, the aircraft had no flaps and no undercarriage, thus there was no choice but to make a belly landing when they arrived back at East Wretham. Incredibly, when the aircraft came to a halt having gauged its way across the turf of the airfield, nobody was injured ! A special order of the day later commended the first pilot F/Sgt Bernát for his airmanship and both Bernát and Haering later received the DFM for their part in the incident. Between the 6th and the 16th July 1941, the squadron carried out attacks on Cologne, Munster, Bremen and Hamburg. It was on this latter raid on the night of the 16th/17th, that Wellington R1718 KX-N was lost in somewhat strange circumstances. The aircraft took off at 2307 hours and nothing was heard thereafter. It would seem that the bomber was attacked by an Me.110 flown by Lt. Rudolf Schoenert of 4/NJG1, who claimed to have downed a Wellington at 0050 hours just west of Lemmer, south of Heerenveren in the Netherlands. However, the crew (pilot F/Sgt Jaroslav Nýč, second pilot Sgt Karel Šťastný , navigator P/O Jaroslav Zafouk, wireless operator P/O Otakar Černý plus gunners Sgt František Knap and Sgt Jiří Mareš) later reported that there had been an explosion in the nose of the aircraft, which they thought might be the result of ‘sabotage’. Karel Šťastný decided to change his name when he arrived in Liverpool to protect family members who remained in enemy hands. Originally a Zemánek, he chose to use the name Šťastný which was his mother’s maiden name and also translated as ‘happy’. Whatever the cause of the explosion, the crew baled out of the stricken aircraft. The pilot, Jaroslav Nýč, was briefly trapped by a jammed hatch cover, but was able to break free and deploy his parachute. He, together with all but one of the crew, became a POW. The rear gunner Sgt Jiří Mareš was later found to have drowned in the Zuider Zee after baling out (he was buried at the Lemmer General Cemetery on the 24th of December 1941). In the small hours of the 17th of July the quiet of the airfield was shattered, when an enemy intruder decided to pay a visit. A number of bombs were dropped and the airfield was out of action for a short while. 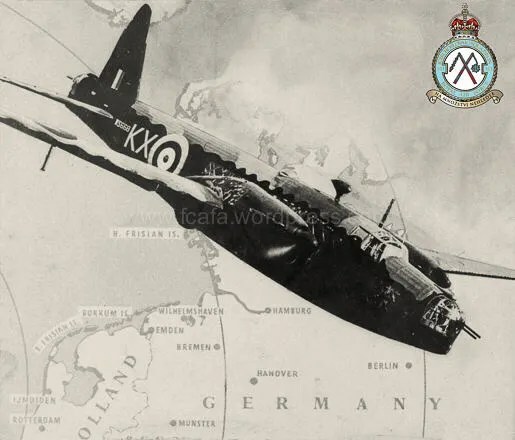 Two nights later on the night of the 19th/20th of July, eight Wellingtons took off to attack Hannover, one Wellington R1371 KX-F failed to return. It had taken off at 2252 hours and was later observed apparently in combat with an enemy aircraft. Both were seen to crash into the sea. The crew of the ill fated ‘F’ consisted of the pilot Sgt Václav Netík, second pilot Sgt Miroslav Jindra, navigator P/O Jaroslav Partyk; wireless operator Sgt Jan Čtvirtlík and air-gunners Sgt Pavel Babáček and Sgt Václav Valeš. The body of P/O Partyk was later washed up on the Dutch coast and he is buried at Grave. Once again, at 0020 hours the airfield was raided, on this occasion the bombs fell amongst the dispersal in the south east corner of the aerodrome. By the close of the month the squadron had operated against Hamburg and Mannheim completing twelve operations and 101 sorties. 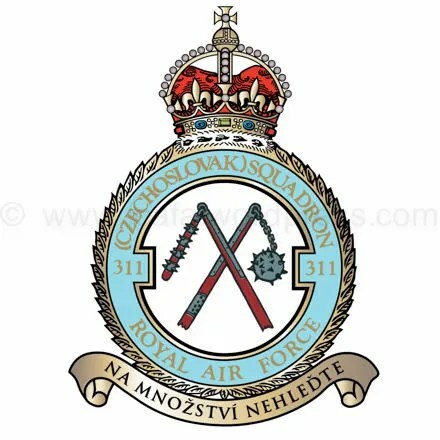 During the month the Czech Initial Training Flight was transferred to East Wretham from Honington and became known as 1429 Czech Operational Training Flight (COTF). The early part of August 1941 was taken up with raids on Hamburg, Mannheim and Hamm. The enemy returned the complement on the 7th, when a lone raider dropped ten bombs on the western side of the airfield. In the early hours of the 13th of August, a number of aircraft were circling the airfield, having returned from a raid on Hannover, Suddenly their thoughts of fried eggs, tea and bed were shattered. An enemy intruder, a Ju.88, had sneaked into the circuit. Three aircraft were attacked and one, Wellington R1777 KX-M was badly shot up but managed to make a safe landing. The following day the target was again Hannover and by the end of the month attacks had been mounted against Cologne, Duisburg, Kiel and Mannheim despite very poor weather. On the 21st of August a team from the BBC visited the unit and interviewed a number of personnel. Some of this material was later broadcast on the Home Service. Shortly after this ‘British Movietone News’ arrived on the station with their cameras and filmed the unit at work and play. The following day (the 27th) personnel were treated to a film show in the NAAFI, which included a showing of ‘Target for Tonight’. This was an RAF training film in which Sqn/Ldr ‘Percy’ Pickard (formerly part of the squadron’s attached RAF staff) played a leading role. Other high points of the month were the award of the DFC to Wg/Cdr Backler, the Squadron Liaison Officer and the formal promotion to Wg/Cdr of Josef Ocelka, the commanding officer. Although the squadron was to operate on only nine occasions during September, seventy two sorties were accomplished. The flights were to be some of its longest. Within the first seven days, Cologne, Bremen, Berlin and Kiel had been hit. Then on the 10th came a trip to pastures new, Turin in northern Italy. A similar trip took place towards the end of the month, when the unit raided Genoa. A further lengthy operation was added to the list on the last day of the month, when Stettin on the Baltic coast was the target. On the night of 15th/16th September the squadron put up ten aircraft for a raid on Hamburg. The weather was clear, but searchlight glare over the target caused problems for the crews and enemy night-fighters were in action. Sgt Vilém Soukup and his crew (second pilot Sgt Jan Miklošek, navigator P/O Mojmír Sedláček, wireless operator P/O Antonín Zimmer and gunners Sgt Zdeněk Babíček and Sgt Alois Jarnot) took off at 1955 hours and nothing further was heard from them and they were all listed as missing in action and are commemorated on the RAF Memorial at Runnymede. It is possible that this aircraft is the Wellington claimed as shot down by Gefr Rudolf Frank of 1/NJG3 to the north west of Meppen at 2330 hours. The elements were to play a major part during October 1941, with cloud obscuring the targets on a number of occasions and icing causing difficulties. The first day of the month saw ‘freshman’ crews being initiated with attacks on Channel ports. On the 20th Sgt Václav Proházka in Wellington R1046 KX-E and his crew failed to return from a raid on Bremen. Nothing was heard after take off until an SOS was received at 2201 hours. Following engine problems the aircraft came down on a sandbank 4 ½ miles south of Schiermonnikoog in the Frisian Islands. The crew (pilot Sgt Václav Proházka, second pilot Sgt František Petr, navigator P/O Erazim Veselý, and Sgts Josef Sůsa, Bedřich Valner and Jozef Zvolenský) were later picked up and became Prisoners of War. On the 23rd tragedy struck the squadron when Wellington T2624 crashed into the Irish Sea of Cardigan with the loss of Sgt Karel Hurt and all of his crew (Sgt Otakar Janůj, Sgt Jaroslav Poledník, Sgt Jaroslav Rolenc and P/O František Dittrich) whilst on a cross country training flight (Base-Llangolen-Maughold Head-10 miles-Aberystwyth-Banbury-Base). As the end of the month approached the squadron personnel celebrated their national day (28th) with a parade, a sports meeting and a remembrance service (the Squadron Padre, Sqn/Ldr František Pouchlý officiated), the service being particularly poignant in the light of the loss of T2624 only days before. The event was attended by the Air Officer Commanding No.3 Group Bomber Command, AVM Baldwin and other senior officers. There was an unfortunate sequel to the loss of T2624 on the 23rd when the squadron was asked to send someone to Newquay in Cornwall, to identify the body of an airman. It turned to be that of P/O František Dittrich, the navigator in Karel Hurt’s crew. (Dittrich was originally buried in Cardigan, but after the War his remains were transferred to Czechoslovakia). The month of November saw the squadron operate on eight occasions, making a total of 53 sorties. The targets included Berlin, Hamburg, Kiel and Dusseldorf. With the onset of December the weather deteriorated and the squadron was only able to operate on five nights putting in a total of 36 sorties. The month was brightened somewhat by the news that the USA had entered the war after the treacherous attack on Pearl Harbour by the Japanese. Christmas Eve 1941 was a day to remember, AVM Baldwin visited the unit to present the recently approved squadron crest to Wg/Cdr Ocelka. The station paraded for the presentation and a ‘Dining-In Night’ took place afterwards in the Officers’ Mess. During the year the squadron had attacked 192 targets and carried out 715 sorties. The unit had suffered 43 aircrew fatalities on operations and had seen 21 airmen become Prisoners of War. 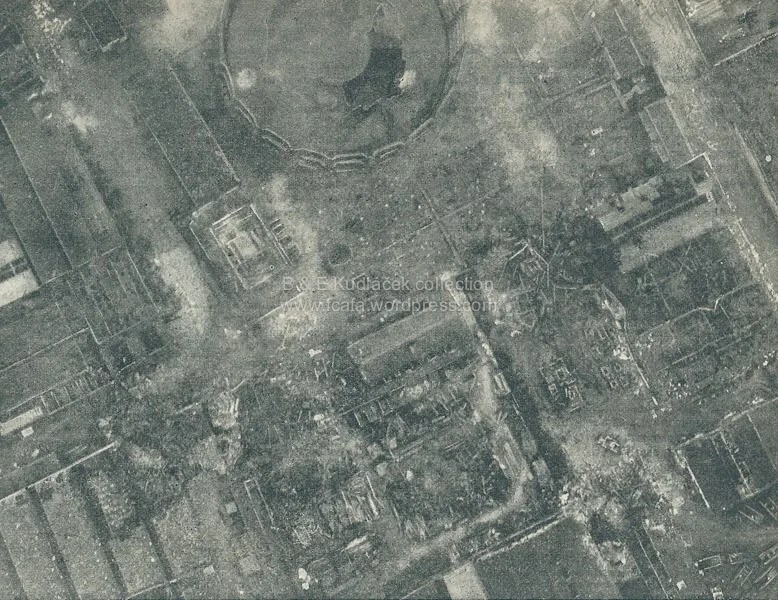 On the night of the 28th/29th of December 1941, Bomber Command despatched 86 Wellingtons to bomb Wilhelmshaven. Only one aircraft was lost, T2553 KX-B. The aircraft took off from base at 1716 hours and nothing further was heard. It apparently came down in the North Sea some 12 miles south west of Den Helder and west of Petten in Holland. It is possible that this aircraft was the one claimed as shot down by Oblt Egmont Prinz zur Lippe-Weissenfeld of 5/NJG2, south west of Petten at 2146 hours. Wesseinfeld claimed to have downed a Whitley bomber, but that could simply be a case of poor target identification in the darkness and the excitement of the moment. Five of the crew the crew (the pilot Sgt Alois Šiška, second pilot Sgt Josef Tománek, navigator F/O Josef Mohr , the wireless operator P/O Josef Ščerba and gunner Sgt Pavel Svoboda) survived and managed to get into the dinghy. Unfortunately the rear gunner Sgt Rudolf Skalický was unable to get out of the aircraft and went down with it. The remaining crew were adrift in their dinghy until the 2nd of January, when they finally came ashore in Holland. Both Sgt Tománek and F/O Mohr had died of exhaustion and hypothermia whilst adrift in the dinghy. The remaining three crew members became PoWs. Mohr’s body was later recovered and he is buried in Bergen General Cemetery. Vickers Wellington Mk Ic, T2553 as flown by Sgt Alois Šiška. The poor weather continued into the New Year, severely restricting the operations of Bomber Command. None the less in January 1942 the squadron was able to carry out 83 sorties against eight targets (including Brest on the 8th, Bremen on the 17th and Bremen again on the 21st). Wellington T2971 KX-J with Sgt Jindřich Svoboda at the controls, was lost on the 17th when it crashed north east of Tilburg at 2317 hours as a result of losing an engine to flak damage (Jindřich Svoboda perished together with P/O Jaromír Brož and Sgt Rudolf Mašek. The second pilot Sgt Zdeněk Sichrovský, Sgt Karel Batelka and Sgt Josef Šnajdr were captured). Wellington DV515 KX-D under the command of Sgt Miroslav Plecitý, was lost on the 21st. He and the rest of the crew; second pilot Sgt Karel Weiss, navigator F/O Zdeněk Skořepa, wireless operator Sgt Stanislav Rouš and gunners, Sgt Čeněk Král and Sgt Ladislav Němeček, were all listed as missing and are commemorated on the RAF Memorial at Runnymede. The Wellington had possibly been damaged as a result of an attack by Ofw Hans Rasper of 5/NJG2, who claimed to have downed a Wellington at 2230 hours three to four miles north east of Harlingen. In February 1942 the squadron received some much needed replacement aircraft from 218 Squadron at Marham in Norfolk. The bad weather continued causing the airfield to be badly waterlogged and making continuation training all but impossible. During the early part of February the squadron operated from Stradishall, personnel travelling back and forth by road. Fortunately during the month there were no losses due to enemy action. Unfortunately though technical problems exacted a toll; Wellington L7841 KX-S was on a training flight with a student pilot and it crashed whilst overshooting at East Wretham. The aircraft had engine control problems and nearly stalled, the starboard wing caught the ground on the airfield boundary. As a result the aircraft bellied onto the grass, fortunately the crew were able to get clear. The rear gunner Sgt Gustav Michalec was thrown out of his turret and injured his back. The rest of the crew consisted of the instructor P/O Josef Čapka, the pupil pilot Sgt Josef Laichter and Sgt Jan Neradil. Raid on Renault Works, Billancourt, France, 3-4. 3.1942. The weather improved during March and the squadron’s sortie count began to rise. During the month attacks were carried out on Emden, Essen, Kiel and the Renault factory at Billancourt in France and the total of sorties at the end of the month was 62. 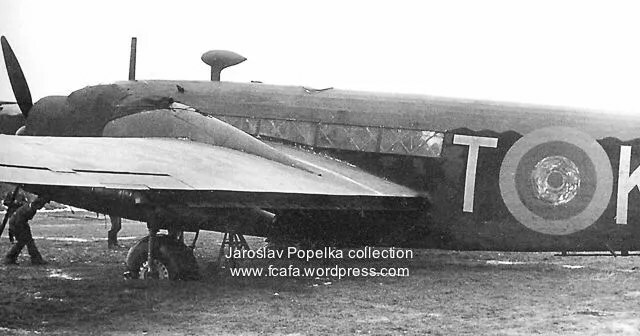 Unfortunately the unit suffered losses; Wellington Z1167 KX-A and the crew of Sgt Karel Danihelka (second pilot Sgt Vladimír Hanzl, navigator F/O Ladislav Říha, wireless operator Sgt František Janča and gunners Sgt Adolf Podivínský and Sgt Dobromil Špinka) and are commemorated on the RAF Memorial at Runnymede, and Wellington Z1070 KX-Y and the crew of Sgt Bohuslav Hradil (second pilot Sgt Jan Kotrch, navigator Sgt Alois Tolar, wireless operator Sgt Josef Svoboda, plus gunners Sgt Imrich Kormanovič and Sgt Pribyslav Strachoň) were both lost on the night of the 3/4th 1942 and are buried at Creil Communal Cemetery, Oise, France. Wellington R1802 KX-P and the crew of Sgt Jiří Fína (second pilot Sgt Oldřich Soukup, navigator F/O Jaroslav Kula, wireless operator Sgt Josef Cibulka, plus gunners Sgt Alois Mezník and Sgt František Raiskup) was lost on the night of the 12th. The aircraft was last heard sending an SOS at 2053 hours followed by a message saying that the aircraft was going to ditch in position 53.17N 03.07E. A search of the area was carried out, but nothing was found and they are commemorated on the RAF Memorial at Runnymede. In addition to the losses, a number of crews were reaching the end of their tours (200 Operational hours at that point in time) and would be screened from operations. That coupled with the fact that replacement Czechoslovak aircrew were becoming harder to find made it clear that the squadron was going to struggle to remain viable as an operational unit within Bomber Command. A further loss was experienced in April, when Wellington Z8838 KX-Z failed to return from a raid on Essen on the night of the 10th/11th. The aircraft had taken off at 2201 hours and a last message was received at 0001 hours indicating engine problems. Shortly afterwards the aircraft exploded in the air and crashed 2 ½ miles east of Kolhorn in the Northern Netherlands (at 0020 hours). It had apparently been attacked and shot down by a night-fighter. The enemy aircraft was probably being flown by Hptm Helmut Lent of 11/NJG2, who claimed a Wellington shot down at 0023 hours south east of Den Helder. F/Sgt Josef Kalenský and his crew; F/Sgt Josef Hrdina, F/O Karel Rychnovský, Sgt Karel Kodeš, Sgt Jan Peprníček and Sgt Josef Politzer all perished. They are interred at the Bergen-op-Zoom CWGC War Cemetery at Noord-Brabant, Holland. A similar fate awaited Sgt Vladimír Pará and the crew of Wellington Z1098 KX-U, when it was brought down by a night-fighter on the night of 14/15th April during a raid on Dortmund. When ‘U’ arrived overhead the target was well alight. With the bombs released the Sgt Para turned for base. Unfortunately on the way back they were caught by searchlights and enemy anti-aircraft fire damaged one of the engines. Sgt Milan Zapletal was wounded by flak splinters and Sgt Josef Taláb did his best to staunch the bleeding, whilst Pará managed to break away from the searchlights. Once again cloaked in darkness they thought they were safe when suddenly out of nowhere an enemy night fighter attacked. The second pilot, Sgt Oldřich Havlík was killed in the attack and the second engine was hit and began to burn. Pará desperately tried to make a forced landing but struck trees as he got near to the ground. The aircraft crashed at Boshoven, Limburg, 2 miles west of Weert in the Netherlands. Sgt Pará and two of his crew (F/O Milan Zapletal and Sgt Jaroslav Klvaňa) managed to escape the stricken aircraft and became PoWs, whilst the other three crew members died (Sgt Oldřich Havlík as a result of the fighter attack and Sgt Josef Taláb and Sgt Pavel Varjan who perished in the crash). They are buried at the CWGC section at Woensel General Cemetery, Eindhoven, Holland. It is thought that the enemy pilot who attacked the Wellington was Oblt Wandham of 1/NJG1. This aircraft was to be the last loss whilst the unit was part of Bomber Command. A few days later the unit’s popular commanding officer Wg/Cdr Josef Ocelka DFC was posted to the Office of the Czechoslovak Inspectorate General and his post was taken over by Wg/Cdr Josef Šnajdr DFC. Ocelka had been with the squadron since its birth and took part in its first operational sortie in 1940. He was held in high regard by all on the squadron and many were sorry to see him depart. He had completed 45 sorties which accounted for some 224 operational hours, the most flown by any airman in 311 Squadron. Unfortunately, he was to die in an aerial accident when the Beaufort (DD938) he was flying crashed on take off from Brize Norton on the 21st of July 1942, whilst he was serving with No.6 MU (Maintenance Unit). By mid April the squadron only had four operational bomber crews, insufficient for the proper conduct of operations. The situation was somewhat resolved when five new ‘freshman’ crews arrived on the 18th. However, they would still need to gain experience ‘on the job’ under an experienced pilot. Towards the end of the month they carried out so called ‘freshman operations’ against the Channel ports of Le Havre and Dunkirk. These were to be the last operations undertaken by the squadron as part of Bomber Command. The decision had been taken to move the unit into Coastal Command. 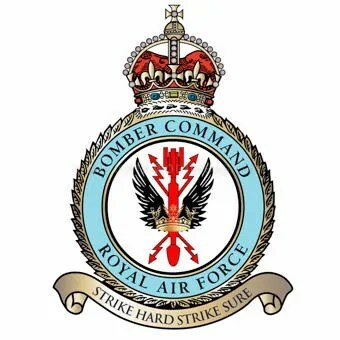 During its time as part of Bomber Command the unit had completed 1,029 sorties against 77 targets, dropping nearly two and a half million tons of high explosive bombs and over 95,000 incendiaries and operating on average every fourth day. The price had been high however, 94 aircrew had died on operations and a further 34 had been taken prisoner. 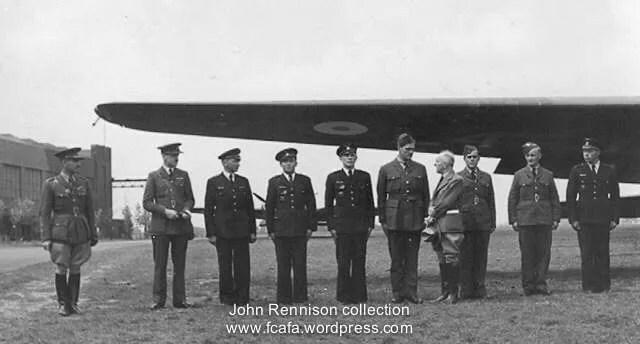 On the 24th of April the new Squadron Commander, Sqn/Ldr Josef Šnajdr flew, together with other officers, to Aldergrove, Northern Ireland to make arrangements for the move of the squadron into Coastal Command. However, Bomber Command had not quite seen the last of 311 Squadron, they would be back for a ‘swan song’ in a few weeks time. This entry was posted in 311 Sqd, Information. Bookmark the permalink. Lovely stuff and very interesting. My Dad was Flight Sergeant Jaroslav Minx – WOPAG. He flew mostly in Liberators and took part in the famous “Let’s add some oil to the fire” attack on German warships protecting a submarine. As a child I remember him telling me about this event. I now have a framed print of the famous painting hanging in my living room. He married my Mum Doreen Tweed who was a WAAF telephonist attached to 311 Squadron. I would like to learn more about the switch from Bomber Command to Coastal Command. I was born in 1945 when my Dad was somewhere over the North Atlantic! This is an amazing article. At the age of 70 yrs, I have found out about my father. Beaulieu 1943. His name is Stefan Fonta 788217. I have just obtained a photograph,but would love any information. I am very proud to find that he served for this wonderful squadron. Awesome! I’m Australian, but have read War Dog about Antis and Robert Vaclav Bozdech. One of the most touching stories I have ever read. I am really drawn to the very brave Czechs. I do RAF reenacting over here, and now am going to sew Czech shoulder titles on my uniform! I really enjoyed reading this article. Most intriguing. I enjoyed reading this very interesting and highly informative article, and was very happy to see a piece written about my father Václav Bozděch and his dog Antis. We need articles like this to remind ourselves and the generations of what our brave servicemen and women went through during and after the war. Just wondering if you have any old pictures of them? Terrific article, many, many thanks for researching and writing it. I’m always interested in any anecdotes or history regarding the 311th, since my dad was a member of it also.